This article is Round 2 of the Underdog’s Corner, a series spotlighting various lesser-used commanders and their place in the format. Each article makes the argument for a single commander that deserves more play, as well as highlight key cards and synergies. In the previous article, I described my affinity for the underdog using one of my favorite commanders, Arjun, the Shifting Flame as an example. This round I expound upon the virtues of a certain red-blue-green legend from the plane of Tarkir. 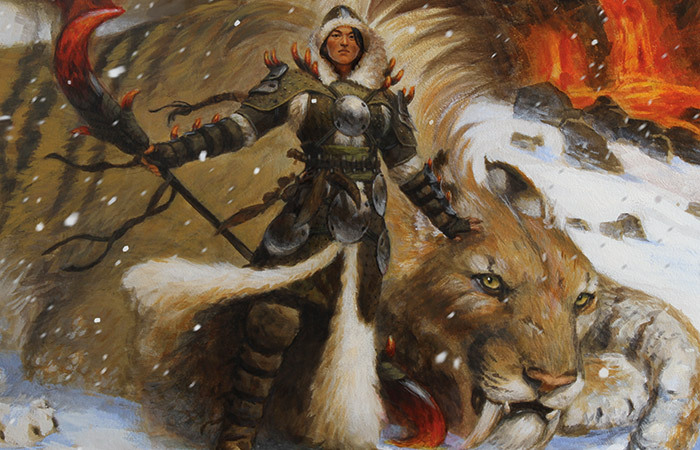 EDHREC reveals she has barely half the number of deck lists as Surrak Dragonclaw, her Khan-counterpart from the future, and he is already only the fourth most played commander in the Temur clan. Please give a round of applause for our newest underdog, Yasova Dragonclaw! For those that may not remember, Yasova Dragonclaw was one of the first, if not the first, cards spoiled from Fate Reforged. At the time, Khans of Tarkir had just been released and introduced incredibly popular three-color commanders, such as Sidisi, Brood Tyrant and Narset, Enlightened Master. The reveal of Yasova not only heralded another cycle of three-colored “wedge” commanders, but also the return of hybrid mana. Her reveal generated astounding levels of excitement. I like to play my commander early and often, so Yasova already gets a check in the pro column for costing only three mana. Additionally, due to part of her color identity coming from her triggered ability, she is very easy to cast, needing only one green and two of any color mana. 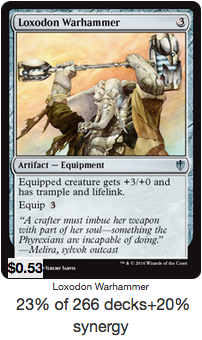 Her four-power with trample is enticing for her low cost, but with only two toughness, she probably won’t be swinging for the fences unassisted after the first few turns. Luckily, Yasova’s ability doesn’t care if she attacks despite the menacing weapon she’s sporting in her art. This takes away some of the fragility that her low toughness brings while adding a bit of versatility to her ability. Since her ability triggers as the start of combat and doesn’t require any tapping it can be activated as many times as we have mana and valid targets. This gets very interesting if we can generate extra combat steps. World at War and Aggravated Assault are probably my top picks if you’re looking for extra combat effects. However, the more I look at Godo, Bandit Warlord the more I think he would be a really solid choice as well. His ability to tutor equipment straight onto the battlefield might turn out to be useful as well. Ultimately, I think the choice of extra combat spells will ultimately come down to preference. 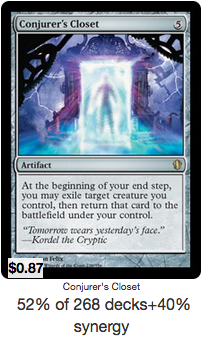 The cost of Yasova’s ability parallels cards like Act of Treason and Threaten, but with a heavier color requirement. Since her cost is tied to a triggered vs. an activated ability, the cost can’t be reduced with cards like Heartstone or Training Grounds, which is a mistake I made when I originally read the card. This is probably the hardest part of Yasova to work around, since her ability is very mana-intensive and quickly becomes expensive if you plan on accomplishing multiple attacks a turn. I’ll talk more about how we plan to do that later. Rules Note: Despite how her card may read, Yasova’s ability is paid for once it resolves. This means we won’t lose out on mana if an opponent decides to sacrifice the targeted creature in response. Her ability only allows us to take control of creatures with power less than Yasova’s power of four, so it’s not quite Threaten. However, her colors provide access to a treasure trove of buffing effects that allow us to steal larger creatures. While it’s possible to buff Yasova’s power to great heights, doing so can take more resources than we’re willing to spend. Our goal is to get Yasova’s power to at least seven with only one card so she can steal powerful creatures like Sun Titan, most other commanders, and, as a bonus, allow her to deal lethal commander damage in three hits. 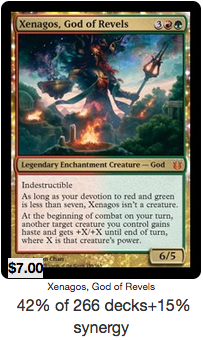 Xenagos, God of Revels is one of best cards for this, and I’m actually surprised it only appears in 42% of EDHREC’s decklists. The partying satyr gives us multiple options, while also being a strong card independent of Yasova. His ability triggers at the beginning of combat just like Yasova’s, so we’re able to stack them. We have the option of stealing and buffing an opponent’s creature to launch at someone, or we can buff Yasova and then steal a larger creature. I’ll repeat it, but the cheaper the effects we can get, the better. Loxodon Warhammer is a one of my favorite equipment in the game. It gives Yasova the desired +3 to her power, while allowing her or another creature to swing in for some life gain. However, the cost may be a little too high overall for what we’re looking. Let’s look at O-Naginata as an alternative. 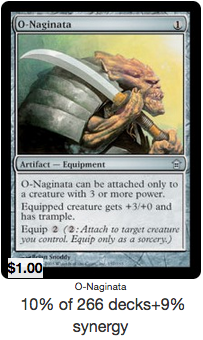 Only 10% of decks use O-Naginata as opposed to 23% for the Warhammer, but I think it could see a bit more use. 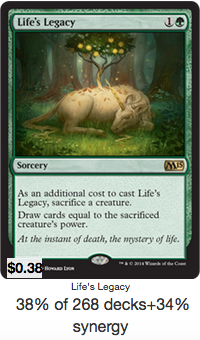 We trade out lifelink for a lower converted mana cost and a lower equip cost. Sure, it also can only be attached to creatures with power three or greater, but with Yasova’s native power being higher than that, we should be fine in most cases. Here are a few more equipment that add some additional value to Yasova. Both Sticher’s Graft and Grafted Wargear give Yasova a similar boost while offering a very cheap cost. The “downside” of each of these equipment is that once equipped they’re stuck, but for us this is can be an advantage. If we’re in a situation where Yasova doesn’t need to wield the equipment, each can be used as a way to sacrifice the stolen creature. It wasn’t until recently I considered Assault Suit for inclusion in the deck, and considering it doesn’t appear on Yasova’s EDHREC page at all, I guess others haven’t either. At first glance, it doesn’t fit the two criteria we set for our equipment to start, so why are we looking at it? This card is just fun. Once equipped, the creature will continue to wear the suit once the owner regains control. This allows us to pass the equipped creature around the table. Sharing is caring, right? 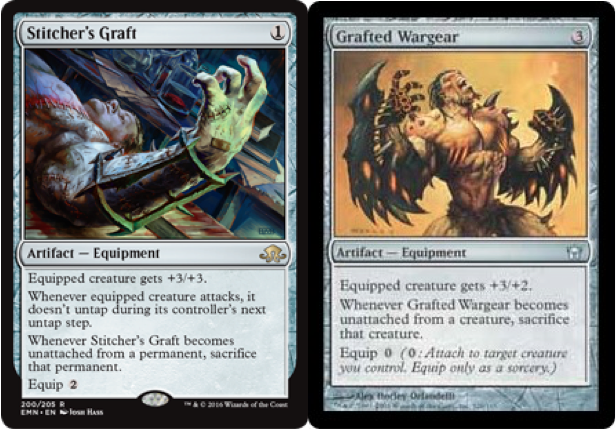 We already touched on the potential of sacrificing our opponent’s creatures with Sticher’s Graft and Grafted Wargear, but we’re about to make that a consistent and core part of our gameplan. 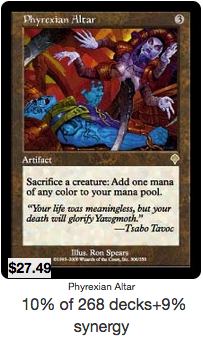 Sacrificing our opponent’s creatures for value is probably one of the bigger allures of Yasova. Let’s look at the few sacrifice outlets which I consider our top options. 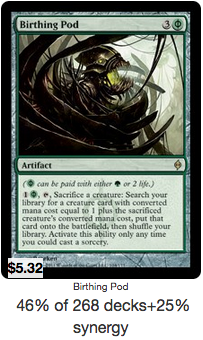 We’re going to look at a few permanents and spells that round out our sacrifice outlets. Evolutionary Leap is flat-out amazing. It’s not quite Survival of the Fittest, but it does a fine impression for our purposes. For a single green mana, we can turn one of our opponent’s creatures into a creature card of our own. I discussed Yasova’s ability being mana-intensive, and this card fits exactly we want to do. However, this is only the start of how we’re going to advance our position with Yasova. If Assault Suit added a layer of politics to Yasova’s game, Birthing Pod adds many layers of decisions. Every creature on the board is now a tutoring piece if Yasova can steal it. Being able to hand-pick our pod targets adds incredible flexibility to our game plan that allows Yasova to rapidly answer problems. If we don’t have a problem, we can start working on finding a win-condition or building our board. There are a few sacrifice outlets that don’t have as much synergy as Pod and Leap, but they let us sacrifice for free so they’re more than worth considering. Ashnod’s Altar and Phyrexian Altar allow us to get a refund on some of the mana spent on Yasova’s ability, as well as eliminating a problem creature. Goblin Bombardment allows us to ping a creature or a player, which adds a little insult to injury for taking from others. That’s ok, because it only get worse for them. Usually I’m a proponent of a permanent’s repeatability over instants and sorceries, but since each of these spells require sacrificing a creature as an additional cost, I think they’re worth a look. 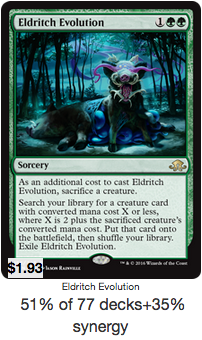 While it may be a one-shot, Eldritch Evolution still offers us the same flexibility and options that birthing pod does.Life’s Legacy and Momentous Fall both translate our opponent’s creatures into card draw. 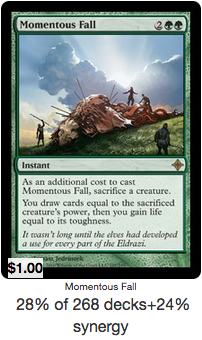 Momentous is a bit tougher to sell because of its cost while Life’s Legacy offers the same draw power for half the cost. If you’re interested in a more permanent and repeatable way to draw cards, Greater Good is an excellent choice. What if we really like the creature we just stole? For me, if I steal a Sun Titan or Vorinclex, Voice of Hunger, I want to keep it! Look no further than Bazaar Trader and Conjurer’s Closet for answers to that problem. 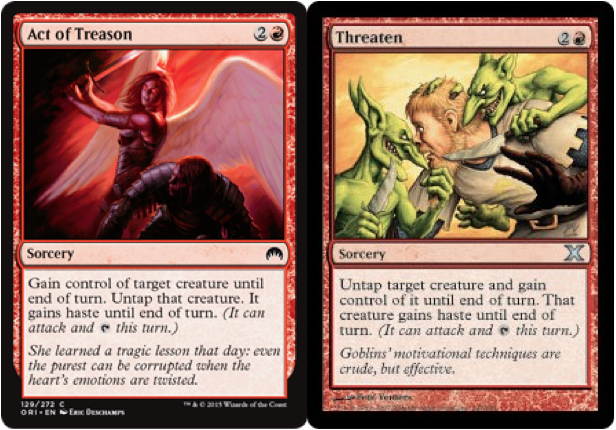 Both of these cards target a “creature you control,” which is where our permanent ownership begins. Bazaar Trader targets the stolen creature, and then we gain control of it. Closet exiles the creature and returns it under our control at the end of turn! Pretty simple, but it allows us to permanently steal our opponent’s creatures. Willbreaker doesn’t give us permanent control, but it goes provide several interesting interactions. With Yasova out, we actually get to steal creatures for free. Once Yasova targets a creature with her ability, Willbreaker takes control of that creature and counters Yasova’s ability. 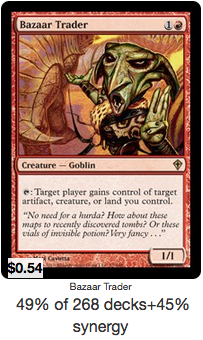 This is also how things will get worse with Goblin Bombardment. 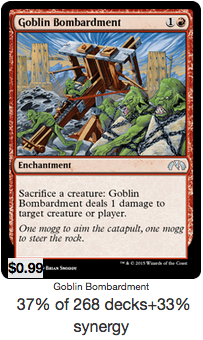 The chain only needs a single creature to start, but once it gets going Goblin Bombardment and Willbreaker let us steal and kill every creature on the board for free. For. Free. Helm of Possession and Proteus Staff are two of the most exciting inclusions for Yasova in my opinion. If Yasova can only steal a small creature, Helm of Possession lets us trade up. 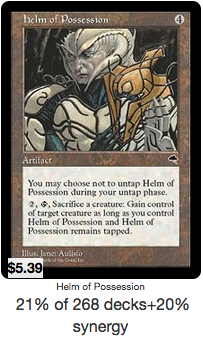 Additionally, if the stolen creature has been a pain to the table we can use helm as a sac-outlet as well. It’s only used in 21% of Yasova decklists, which is a little surprising. 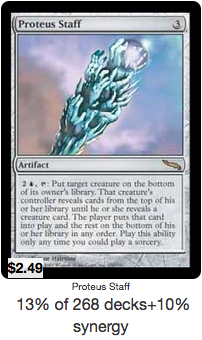 However, Proteus Staff is even more shocking to me, appearing in only 13% of EDHREC’s deck lists. That’s a travesty, in my opinion, for the work this artifact can put in. Just like Bazaar Trader, the staff can target a creature we control. However, once we tuck the that creature into its owner’s library, we’re the one that gets to trade it in for a random creature in our deck. Not only are we making the target much more difficult to access for our opponent, but we also actively advance our game state. Even in instances where we don’t get maximum value out of the Staff, it can still remove problem creatures from the table. Sometimes a single creature isn’t going to be enough to turn the tide of a game, and we need to end the game quickly. Insurrection and Mob Rule both fit that description while also keeping our win-condition on theme. If we have a sacrifice outlet, even if we don’t win the game with these spells, we can certainly cripple the opposition. A few other cards that can accomplish this to a smaller degree are Mass Mutiny and Molten Primordial, but with these we’re looking to take our opponent’s best creature instead of all of them. Feed the Pack, Shaman of the Great Hunt, Reins of Power, Perilous Forays, Primal Growth, Polymorph, Jalira, Master Polymorphist, Berserk. Thanks again for joining me in the Underdog’s Corner!